About the Book: All of us find our wheels spinning at various times in life. In the face of grief, depression, fear, prejudice… or just plain laziness, we find our wheels slipping and sliding in ruts we can’t seem to rule out of. 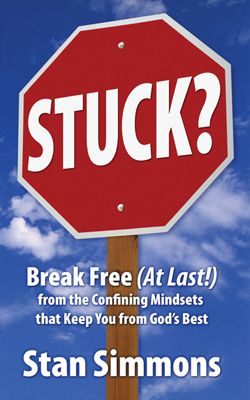 If we’re stuck—mentally, physically, or especially spiritually—how do we get un-stuck? How do we find the traction to start moving again? Design Requirement: To match the look of the print edition as much as possible. Left-aligned chapter headers and non-indented first paragraphs hold true to the print designer’s vision, while clickable footnotes take advantage of e-book technology for a smooth reading experience. Stuck? is currently available at Amazon.